Tomorrow I'm leaving for the International Quilt Festival in Houston, followed by a business meeting in San Antonio, so I wanted to complete this week's EDM challenge before I leave. 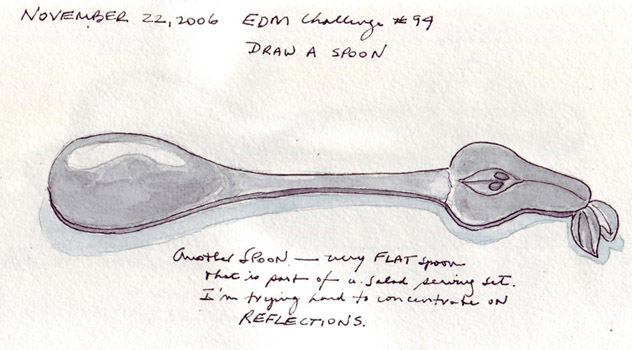 EDM Challenge #94 was Draw a Spoon. 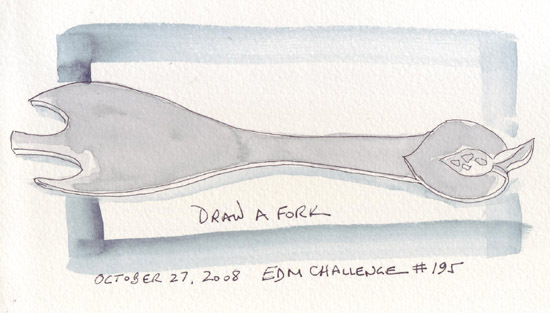 This week it is Draw a Fork. I posted the two of them together because they are a wonderful pair of salad utensils - shiny silver that I still can't capture. 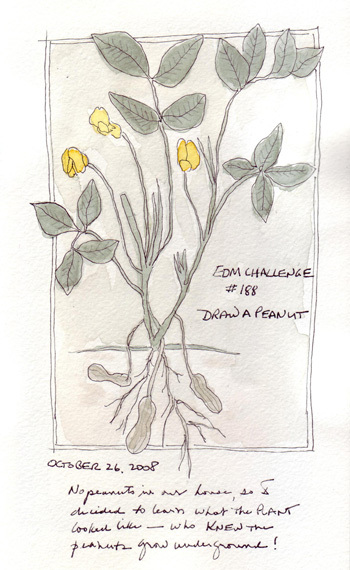 We didn't have any peanuts in our house - and I couldn't find anything to inspire me to do this challenge when it was posted - until yesterday. I then decided to learn more about how peanuts grow and looked at information and images on the web. This is a painting of a plant with its flowers and peanuts. I really didn't know that peanuts grow underground from shoots that arise from the above ground plants. Very cool! I continue to practice drawing faces and figures from photos - and did these 4 during October. 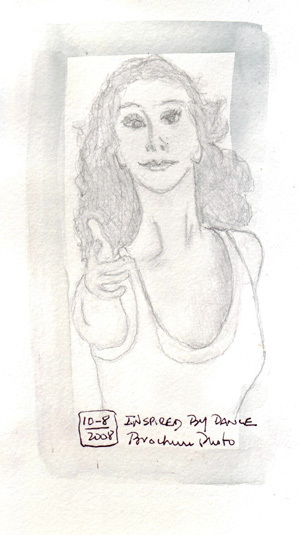 I selected this photo because of the foreshortened right arm and was happy with the arm drawing. Not so much with the eyes. 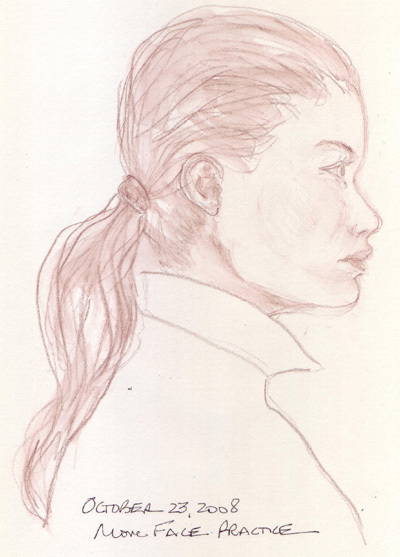 This drawing was done from a runway photo. I saw and loved a Klimt-inspired gown in the window of Oscar de la Renta's store on Madison Ave. 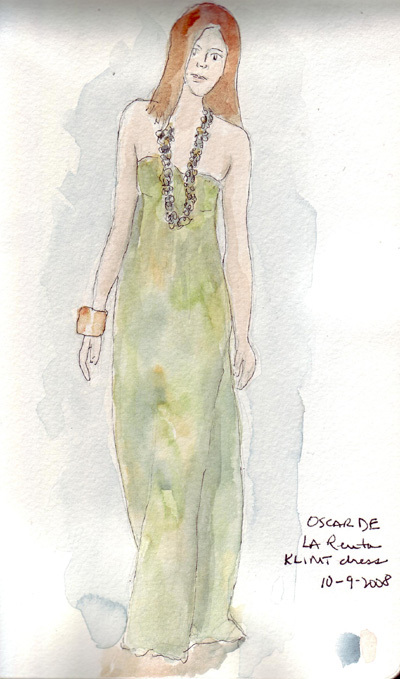 This is the image of the dress from the runway - but I didn't even try to reproduce the fabric design. Two faces drawn from magazine advertisement photos. 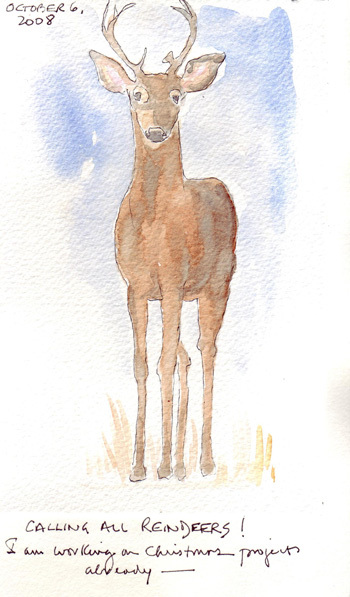 The Virtual Sketch Date photo was just perfect when I was deciding what to draw and paint for my daily journal page. I usually only do the EDM challenges, but this is the second month that the photo for VSD was irresistable. I am very busy in Oct, Nov, and Dec - anticipating all of the Christmas sewing and quilting that needs to be done. So like Santa, I put out a call for reindeer help. 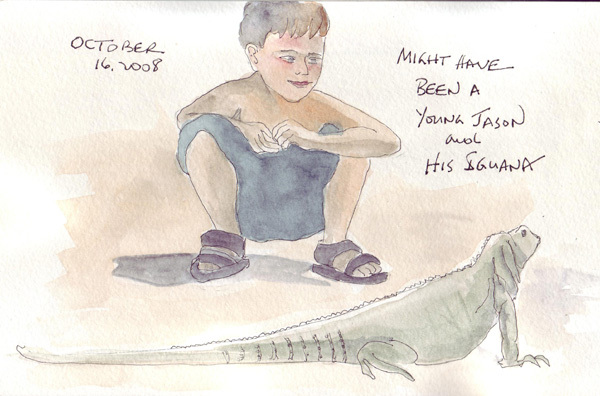 My son Jason had a pet iguana during college and most of medical school. We all grew to love Pablo as long as he was safely looking at us from his fabulous terrarium that was built by my son. This photo was an excellent inspiration and challenge for me - especially drawing a figure with a face! My husband and I worked as volunteers all Saturday morning sorting books for the upcoming Goddard Riverside Book Fair and then spent the afternoon watching our grandchildren enjoy the Halloween Fun Fair that my daughter organized as a fund raising event for their nursery school. After carving a pumpkin with my grandchildren at dinnertime, we came home and collapsed. 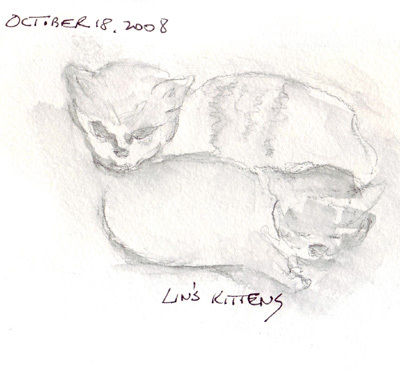 I almost didn't do a journal page for Saturday - and then picked up my sketchbook, a washable graphite pencil, and a photo of Lin's kittens and did a very loose sketch in the few minutes before bed. 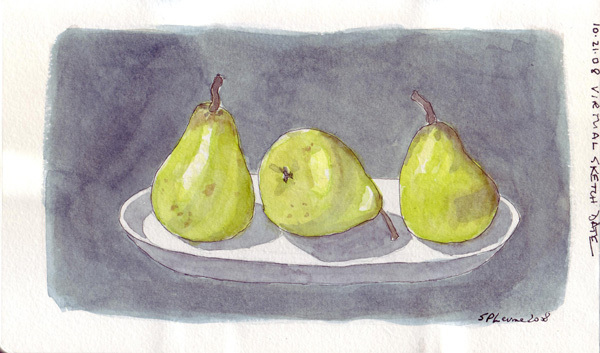 I try to sketch daily and rarely, if ever, will give in to being too tired or too busy. 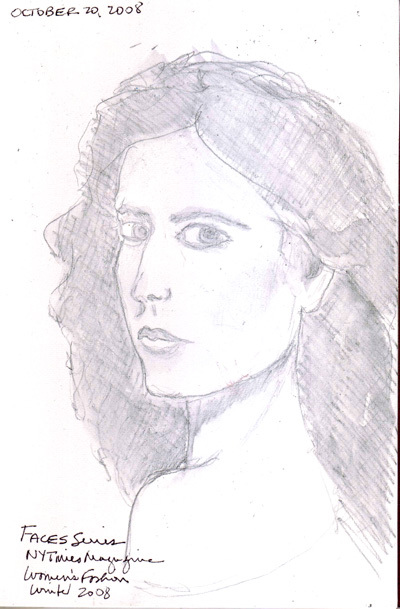 But some days, a 5 minute sketch like this seems like a huge accomplishment.